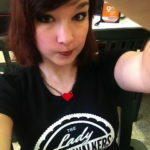 Tifa Robles is the founder of the Lady Planeswalkers Society, which aims to create welcoming, friendly environments for women (and everyone) to learn Magic: The Gathering. Since its founding in 2011, the group has grown and now has branches in cities around the globe. In this episode, Tifa and I discuss how the Magic: The Gathering scene has changed in the last five years and what the LPS has done to address issues of harassment; how players can create diverse, safe play spaces, including starting their own LPS branch; and how playing a collectible card game isn’t as expensive as it may seem. We also talk about Tifa and her husband’s challenges raising a family. In 2015, Tifa and Mike experienced a miscarriage — a phenomenon that is more common than they realized. They want to let parents-to-be know how to cope with this tragedy and that it’s okay to talk about it. This episode does contain some language as an example of the harassment some gamers receive, and discussion about starting a family may hit close to home for some; therefore, despite the absence of swear words, this episode has an “explicit” tag.